Clifton Wayne Karhu was born in Duluth on November 23, 1927, along with his twin brother, Raymond Arthur Karhu. Their parents, Arne H. Karhu and Anna (Lido) Karhu, were both painters. Arne was born in Michigan on August 11, 1902. Anna was born in the state of Virginia on October 15, 1898, and moved with her family to White Township, just south of Aurora in St. Louis County, Minnesota, in the early 1900s. Her father was a farmer. Arne and Anna had moved to Duluth about 1925. Arne worked as a clerk for the George A. Hormel Co. on Michigan Street. In Duluth they first lived at 1430 East Third Street and then at 1112 East Third Street. Clifton attended elementary school and then Franklin Junior High School, which was located at 411 East Seventh Street. Franklin was closed in 1946. The Karhu family left Duluth about 1944 and moved to Worthington, Minnesota. Clifton attended the Minneapolis College of Art and Design and then served in the U.S. Army in Japan. He returned to Japan to work as a missionary and Bible salesman, but became disenchanted with the work and turned to art and teaching English. He worked in relative poverty for years, but eventually began creating traditional Japanese wood block prints that were very popular. He appeared on NBC’s Today Show in 1971, and was the subject of a lengthy article in the Los Angeles Times in 1986. Also in 1986, he presented a retrospective exhibition of his work at UMD’s Tweed Museum of Art. Clifton Karhu passed away from liver cancer on March 24, 2007 in Kanazawa, Japan and did not live to see his 80th birthday in November, reported the Minneapolis-St. Paul Star Tribune on March 27, 2007. 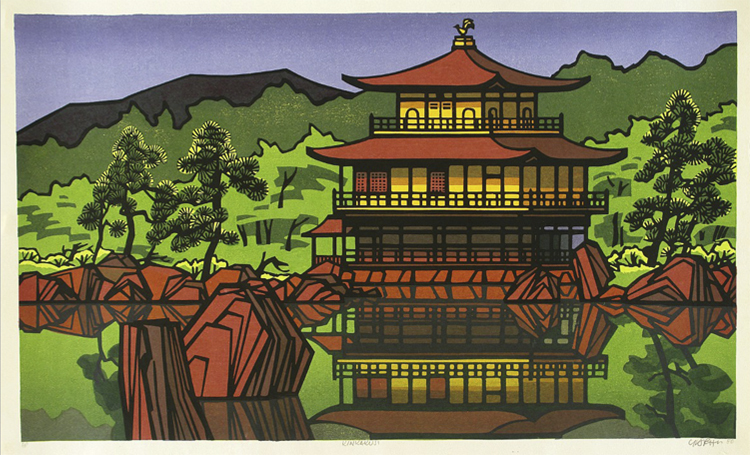 Karhu had lived in Japan for over 50 years and found in Kyoto everything that he needed, not only for art, but also for himself. His career as an artist began early at the age of 12 when the young Clifton Karhu picked up drawing. He was born on November 23, 1927 in Duluth, Minnesota, along with twin brother Raymond. Their parents were painters. But instead of enrolling at an art academy, he joined the military. No one could have guessed at the time, how important his station with the U.S. Army in Japan was for him. He had already fallen in love back then with the country, where he worked as the regiment’s artist. Upon returning to the U.S., Karhu studied art at the Minneapolis School of Art (today Minneapolis College of Art and Design) from 1950 to 1952. Tetsuo Yamada and Tomio Kinoshita, according to the literature, were to have encouraged Karhu in 1963 to pursue color woodblock printmaking. He very quickly joined the elite of the contemporary printmakers in Japan and he exhibited yearly from 1966 until his death at the renowned CWAJ print show, an exhibition of Japanese contemporary prints. He also exhibited his works internationally, in particular in the U.S., Sweden, and Finland. Clifton Karhu leaves behind his wife, his brother and sons Philip (London) and Joel (Kyoto area), daughters Beth (New York) as well as several grandchildren.